MV LeConte is out of service while her generators undergo repairs. Mechanical issues with the MV LeConte generator have caused the cancelleation of her April 2, 2014 sailings. The situation is currently being assessed & updates can be obtained from the Juneau ferry office. BC Ferries carry 20 million passengers over 25 routes & 47 ports of call every year. Whether taking an Alaska ferry from Bellingham WA or a BC ferry from Port Hardy BC, the Inside Passage journey provides unparallelled views of the coast. Only one hitch - the beauty of these "mini cruises" is now common knowledge making advance bookings mandatory. Bookings for summer 2014 Port Hardy - Prince Rupert ferry sailings can be made now on www.ferrytravel.com. Ferries are an integral part of life on the BC, WA and Alaska coast. The popularity of the Alaska Ferries on a global scale coupled with their limited sailings means reservations are absolutely required months and months in advance. BC Ferries provide some on the worlds most spectacular scenery as you travel thru the Inside Passage. Ferry from Vancouver (Tsawwassen or Horseshoe Bay terminal) to Vancouver Island at Nanaimo (either the Duke Point or Departure Bay terminal) then drive up the Island Hwy, thru famous Campbell River to Port Hardy before relaxing on the graciously appointed MV Northern Expedition as she travels to Prince Rupert. Fabulous "will not be undersold" package policy makes combining a Victoria hotel stay with a Ferry from Seattle the best price available. 2014 ferry bookings for travel commencing 01 May will be available within the next week. Alaska ferry space sells out quickly so if planning a summer trip to the "Last Frontier" call 1-800-686-0446 to ensure securing cabin/ vehicle space during the high season. Hand Guns / Semi & Automatic weapons are not allowed into Canada. If driving the Alaska Hwy (also known as the ALCAN because it dips into Canada) or, if traveling by ferry to Haines Alaska, be aware that you will need a passport after disembarking because to drive to Anchorage, Fairbanks etc is thru Canada. A DUI conviction is considered a felony in Canada and can result in being denied entry into the country. 2013 gave no sign of the recession for the Alaska Marine ferries. Cabins and vehicle space are the 1st thing to sell out so if planning a trip in 2014 - Book early ! Overcast skies did little to dampen the enthusiasm of Alaska Marine personal as they brought their 50th birthday celebrations to the Port of Bellingham recently. The MV Kennicott has been delayed due to high winds. 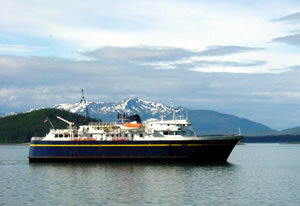 MV Lituya has change her home port from Port Chester to Annette Bay Alaska. She will make 2 daily round trips sailings Thu, Fri, Sat,Sun. Ferry sailings to /from Whittier have been cancelled while the dock is being repaired. 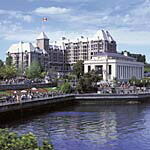 Book a ferry between Seattle & Victoria - add a Victoria hotel for 1, 2, 3 or more nights and get the lowest price - Guaranteed. *1 Child is $10 with round trip paying adult when purchasing a hotel package. Prices are per adult and based on double occupancy. Date, voyage, space limitations, advance purchase and other restrictions may apply.